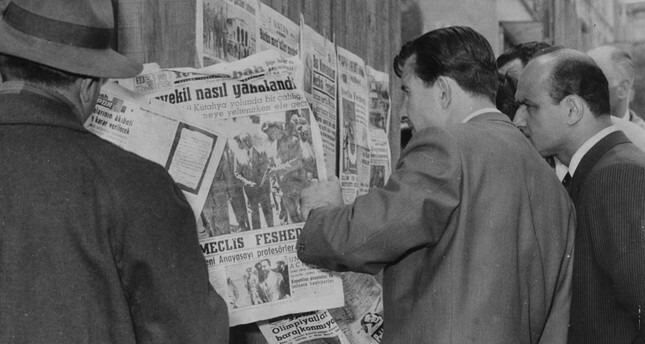 Citizens at a newsstand read of the arrest of Prime Minister Menderes after the coup in 1960. Turkey did not join World War II, but it obviously had its share of the following troubles. Aside from political oppression and reaching a peak level of economic distress, the country's situation looked as if it just came out of the war. To secure a place in the new world order through the United Nations and receive economic aid from the U.S., Turkey recognized the international democratic order. Founded by the opponents in the Republican People's Party (CHP) in 1946, the Democrat Party (DP) came to power with an overwhelming majority in 1950. Coming from the liberal Kemalist wing, Celal Bayar became president and Adnan Menderes, an Aegean farmer, became prime minister. 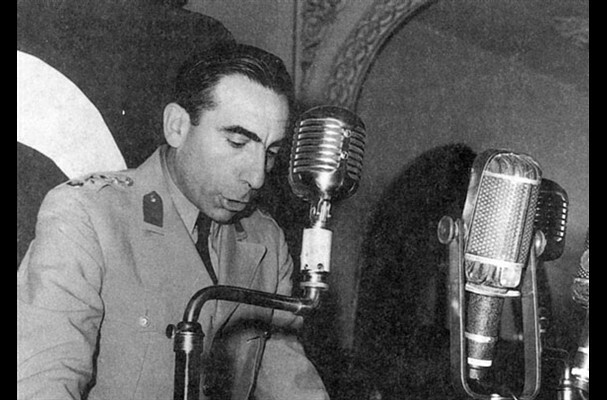 Col. Alparslan Türkeş reads the declaration of the coup on May 27, 1960. The newly established government eased the pressure previously put on religion and religious people, improved commerce and industry and gave importance to public works. Combatting poverty for 50 years, the people in Turkey were finally happy. The public saw the DP government as one of their own and embraced Menderes. However, Menderes, who was a do-gooder and kind person, was surrounded by an invisible chain controlling his actions. The government tried to remove the CHP's advantageous position over other political parties and all the properties that the CHP acquired unjustly during its time in power during one-party rule were transferred to the Treasury. Following the Istanbul Pogrom on Sept. 6-7, 1955, which was part of a secret plot and resulted in the harassment of Greeks and other sections of the non-Muslim community in Istanbul, the government assumed a more authoritarian administration. The DP lost votes and deputies following the 1957 general elections. Meanwhile, a coup attempt planned by nine military officers was exposed as well. The perpetrators were punished but the government did not follow it up thoroughly. After 1958, inflation and devaluation, the results of the high development in the country, birthed an economic depression. Devaluation caused Turkish lira to lose its value threefold. Civil servants, especially those in the military, were not happy either as they saw their monthly wages turn to dust. The DP's reaction was to establish a partisan public organization called the Homeland Front. The CHP chairman, İsmet İnönü, set off on a nationwide tour, the "İlkbahar Taarruzu" (Spring Attack), during which he used his memories of the Greco-Turkish War as a tool. The tour triggered negative incidents. Some CHP partisans attacked the DP buildings and, in return, İnönü was catcalled and people threw stones at him, which heightened the tension. 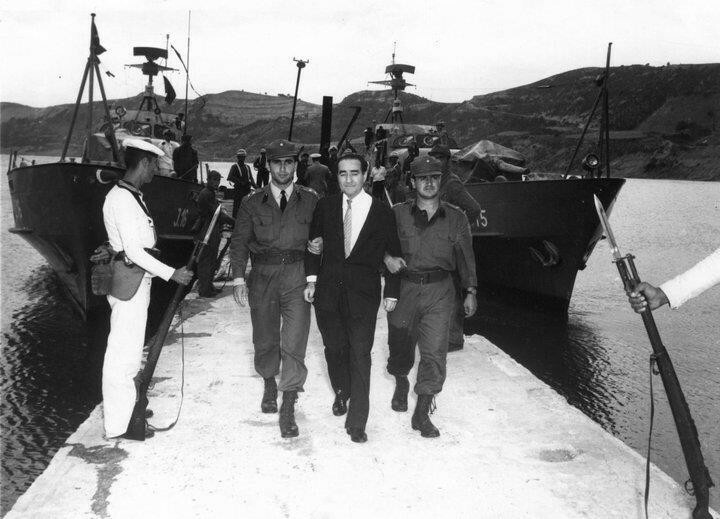 In the aftermath of 1960 coup, Prime Minister Adnan Menderes was arrested and taken to a cell on the İmralı Island. The final straw was the government's decision to establish an investigative commission in Parliament to overview the activities of some CHP deputies and journalists on April 18, 1960. İnönü, who had a military background that involved coups, openly summoned the military to orchestrate a coup in his statements against the government. His most famous threat was: "Even I cannot even save you if you continue to follow this path. Revolution is a legitimate right for nations once the necessary conditions are set." When he saw that the government paid no attention to his threats, İnönü began to incite the intellectuals. On April 28, 1960, the CHP's youth organization fired the flare of the coup at Istanbul University. Few protestors were killed. Once the police were not able to control the situation, they asked for help from the military. Martial law was declared and the grapevine increased its activities since the press was censored. Exaggerated news against the government began to spread. Demonstrators in Ankara assaulted Menderes, who had joined them to give advice. Bayar, who did not accepted Menderes' resignation, advised him to "shoot people." The military believed that Bayar was the man behind the unrest. Cemal Gürsel, the then commander of the Turkish Land Forces, wrote a letter addressing Menderes on May 3, 1960. "The president should resign and he should be replaced by Mr. Menderes. I believe that the people love this honorable person no matter what. The hearts that have been broken should be mended by channeling this love and we should place trust in people once again." Unfortunately, this letter was never delivered. Parliament went on holiday and the preparations for general elections began. A coup, however, was being prepared in the meantime. To awaken the public and encourage them to rally with him, Menderes set off on his own nationwide tour. On April 25, the military troop that welcomed him in Eskişehir turned their backs on him in protest. Being aware of the situation's importance, Menderes announced that the investigative commission in Parliament would be dismissed that night, but it was no good. A group of officers in the military staged a coup at 3:00 a.m. on May 27 and seized power. Menderes traveled to Kütahya and he and notable DP figures were arrested. 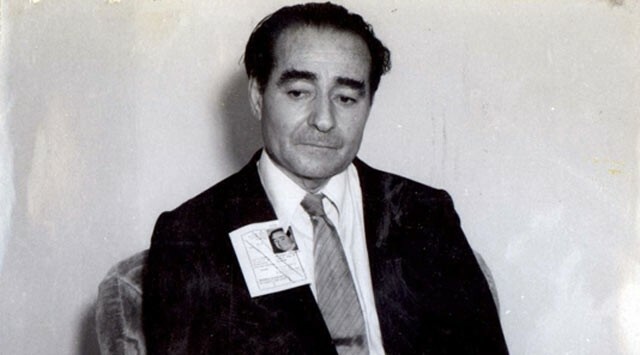 It is said that Menderes was simple-hearted enough to say: "I do not presume that there are officers in the military that would act so dishonorably," after he received the intelligence on the coup. As a matter of fact, Menderes was not content with the structure and control the CIA had within Turkey's National Intelligence Organization (MİT). The U.S. even paid MİT officers' salaries. Menderes's visit to Moscow in order to prevent the intervention and find support for his cause irritated the U.S. Moreover, Menderes's collaboration with Iran, Iraq and Pakistan via the Central Treaty Organization (CENTO) scared the U.K. The perpetrators of the coup were a group of low-ranking military officers. They took hold of critical positions in an hour. Gürsel became the head of state. Pro-government commanders were arrested. Alparslan Türkeş read out the declaration of the coup with his sonorous voice at 4:30 p.m. on the radio. "Our goal is the full observance of the U.N. Charter and Universal Declaration of Human Rights. Great Atatürk's 'Peace at home, peace at world' principle is our flag. We are loyal to all our alliances and commitments. We are a part of NATO and CENTO," Türkeş read. The arrested DP members were taken to Yassıada located off the shores of Istanbul. They were accused of violating the constitution and were detained awaiting trial for a year. Meanwhile, newspapers published articles against Menderes and provoked inappropriate insults and claims in the public. Indeed, many believed that he deserved what was coming for him after his trial was over. DP members were treated badly in prison and court. Their right to defend themselves was limited. According to certain accounts, Menderes tried to commit suicide as he could no longer endure the torture in prison. The court ruled for the death penalty for 15 defendants. Upon a message from then U.S. President John F. Kennedy on avoiding death penalties, the ruling government withdrew and lessened the sentences to life imprisonment except for Menderes, Foreign Affairs Minister Fatin Rüştü Zorlu and Finance Minister Hasan Polatkan. Menderes was hanged in order to destroy the people's beliefs that he was protected by God, as he had survived an airplane crush in 1959 on his way to Turkey form the U.K. The junta abolished the law that prevented death sentences for people over the age of 65. However, İnönü saved his old Young Turk friend Bayar from the gallows. The executions took place on İmralı Island in the Marmara Sea on Sept. 17, 1961. Years later, Prime Minister Turgut Özal restored the honor of the three victims of the coup and transferred their bodies to Istanbul in a state ceremony. The putschists made a constitution controlling the government from all sides, which was written by pro-coup academics and was recognized with force. The constitution was accepted in a referendum with slightly more than half the votes. The electoral system was changed in a way so there was no room for right-wing parties. Those in the junta established the Senate and May 27 was declared a national holiday, Freedom Day. However, only a few years later, political parties that had similar ideologies as the DP took power and let down the putschists' hopes. The 1960 coup brought great trauma with executions to Turkey's history of democracy and is remembered as a shame.